My late wife's family originally came from a wee place in Bishopbriggs called Mavis Valley, or as they called it 'The Vailly. ' It was so out of the way that no public transport could reach it except maybe for the coalman and his horse . You had to get a bus to Kirkintilloch Road and walk the 2 miles alongside canal to get to her front door . The wash house was out back :-.the fireplace was the old range type :-.the toilets were also out back . The house was a room and kitchen with a hole in the wall bed .There were 2 daughters ,a son .a mother and father ,a blind auntie . Believe it or not , they actually took in a lodger .to help pay the ten shillings a week rent . There was no electricity ,just paraffin lamps and in the wash house they boiled the water under a great big tub to do the washing . When her family were moved to Auchinairn ,it was the first time they had experienced electricity . In fact they 'flitted 'on a day my father in laws was working ,so when he came home at night he had to ask someone how to put the lights on . If Jean had been living in 'The Vailly ' when I met her it would have been the end of our relationship. I think . Here's a lsit of old maps. 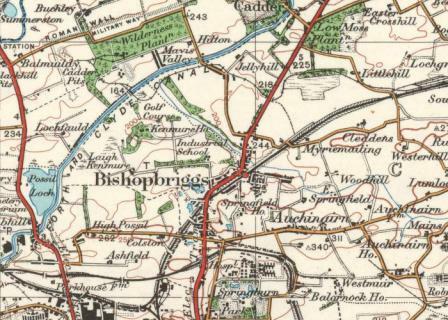 Scroll down to Glasgow click on it and you can zoom in on Bishopbriggs and see Mavis Valley on the map. When I was in Glsgow I bought Old Cowcaddens, Possilpark & Lambhill. Included in the pictures is the funeral procession going over the canal bridge. Many of the miners came from Lambhill and Possilpark. I forgot to add that these books are published by Stenlake Publishing. Besides Possilpark, I bought one on Springburn and Davy sent me the one on Airdrie where my grandfather was born. I have the same one Auchinairnboy. Here's a lovely article by the late Molly Weir on Mavis Valley featured in a 1978 edition of the Scot's Magazine. Whoops I did something wrong, I'll try to get legible. Hi RonD, were you ever able to enlarge the Molly Weir article ? Sorry but the images on G G only allow a certain amount of pixels and so I couldn't enlarge it. If you have a fax I wll gladly send it along. Thanks RonD, don't have access to a fax m/c at the moment, but will keep it in mind. Those who knew Mavis Valley may know of the other residences in the area. Just north of the Mavis Valley were two houses known as Beechwood Villa, which were probably the manager's houses when the mine was in oepration. Beyond that was a row of tenements very near the the old mine that was officially known as Woodside Terrace, a row of flats. They were composed of the kitchen livng area with coal fire as the stove and water heater and two rooms. this are was locally as the Big Pit. My family lived there from 1933 until 1947. There were still people living there in 1958. Sadly, now the area was demolished and has become the local tip. 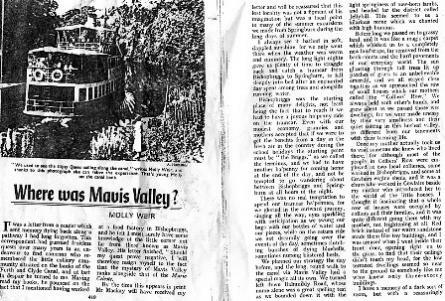 Here's an article on miner housing for Mavis Valley. "10 houses of two apartments, rental £5 4s - One storey, stone built - Erected about 100 years ago - no damp-proof course - Back wall embedded - No strapping and lathing, plastered on solid - Lined with wood where back wall damp - floors wood, not ventilated - internal surfaces of walls and ceilings in fair condition - Windows in back walls are dead lights, with an opening pane, windows in front are sashed. The houses seem occupied by a good class of tenants, so, notwithstanding their ancient structure, there are few sanitary defects"
Thanks to Dexter for the post on Old Maps I was able to "blow up" the area of discussion.